1. A good kaftan that will tide youA�through sunset on the beach and theA�evening that follows. 2. A quirky beach bag that will fit everything from your kaftan/wrap to your book and camera. 3. A pair of great sunglasses, preferably gold rimmedA�aviators to complement your tan. guide book for the globe-trotting woman. a�?The modern Indian woman is a formidable mix of strength and femininity, and the embodiment of our many goddesses,a�? shares Ramani who believes that her clothes specially appeal to those with a taste for independence and a passion for exotic adventure. The Wanderlust collection itself can be broken down into three distinct categories. The Drape series works in the flow of fabric inspired by the traditional sari. Ramani makes use of dark shades and contrast elements, in poncho tops, gathered skirts, fitted maxis and full-length ensembles. The Pomegranate series focuses on applique, cleverly combined with the old Indian dyeing technique a�� bandhini. Featuring rich earthy browns, reds and rusts, the series uses bold applique work, primarily in gold, on kaftans, dresses, cloaks, gypsy skirts, wraps and even swim wear. 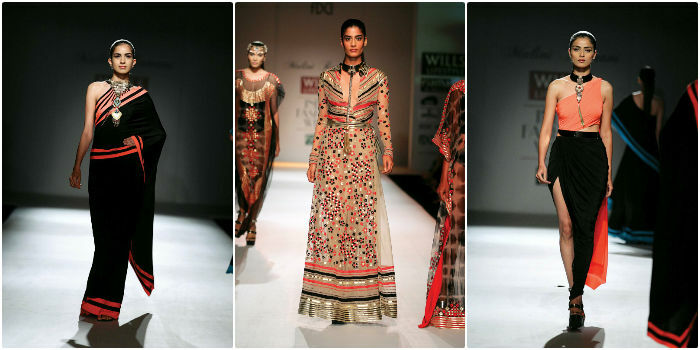 We especially loved the way she merges tribal elements with Western fits and styles. The last section of the collection is dedicated to party wear. Beaten metal sequins are judiciously placed on body-hugging short dresses. Ramani is also known for her flattering swim wear. And for those looking for pointers on luxurious resort options at home, she says that this season too the clothes will be all about comfort, colour blocks and a tantalising air of mystery. a�?Essentially things that will put you in holiday mood while making those around you wonder a little about the piece itself,a�? she concludes.